H Mart isn’t open in downtown Seattle yet, but a branch just quietly opened in the University District. Yay! Chef Rachel Yang shares some secrets of its shopping greatness. The good news is that the marvelous Asian grocery store H Mart is still coming to downtown Seattle. Construction began at Second and Pine last year, to the rapturous excitement of fans who’d been traveling to Lynnwood, Bellevue, Federal Way or Tacoma for the shopping glory. The bad news is that there’s no opening date and, according to a spokesperson, we’re not even close. With Oregon projects taking priority in the pipeline, the downtown Seattle H Mart won’t open until sometime next year. The great news is that meanwhile, H Mart has already arrived in Seattle, debuting recently with zero fanfare in the University District. 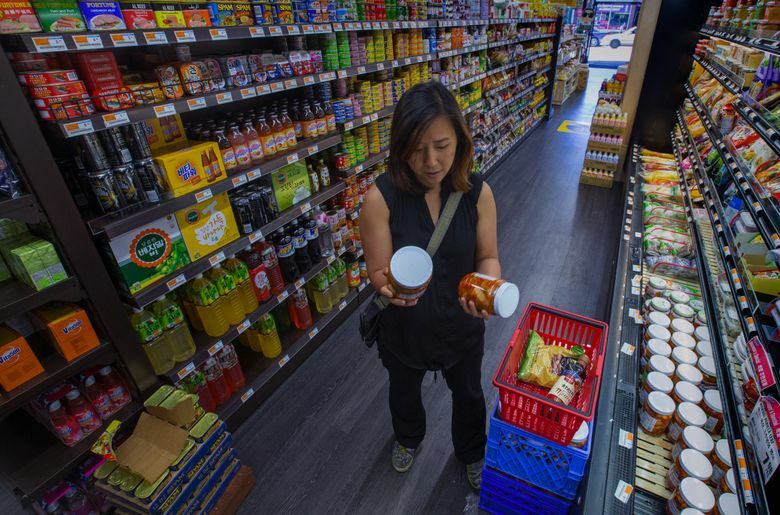 For the unfamiliar: If you love Uwajimaya, you’re going to freak out about H Mart’s vast selection of Asian foodstuffs, starting with what the CEO aptly calls “the magnificent culture of our motherland, South Korea,” and ranging far beyond. Also, part of their mission is to “go out of our way and bend over backwards for the best price,” and it shows. 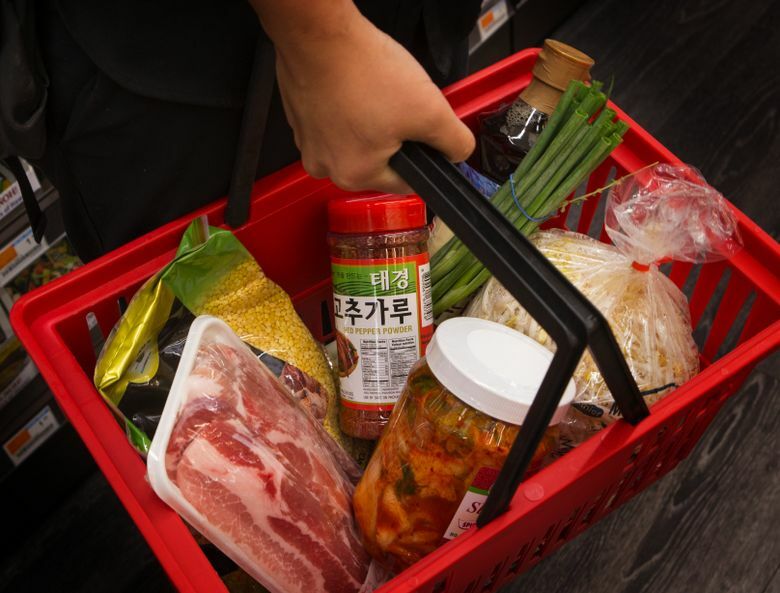 H Mart is short for “Han Ah Reum,” which means “One arm full of groceries,” but you’ll probably end up with more than you can carry. The U-District location is a compact version of the store, on the Ave at 42nd, but it’s stuffed full of all kinds of to-go food and the ingredients for almost any Asian dish you’d care to make. Chef Rachel Yang — who, along with her partner, Seif Chirchi, runs the excellent Seattle restaurants Joule, Revel and Trove (plus Revelry in Portland) — met me at the U-District H Mart to check out the best the store has to offer. My secondary mission was to get ingredients for Revel’s beloved kimchi-and-pork-belly pancakes (the recipe’s available on The Seattle Times website and also appears in Yang’s cookbook “My Rice Bowl: Korean Cooking Outside the Lines,” out in September, available for pre-order from Elliott Bay Book Company, University Book Store and Amazon now). “They really packed this place with stuff!” Yang rejoiced upon walking in. She loves the bigger versions of the store, but she’s also happy that they squeezed this one in so close to campus. “It’s great that it showcases the Asian population of the UW,” she said, then voiced approval of the K-pop soundtrack. The Korean baked goods, she acknowledged, might not be to everyone’s taste — “All very fluffy, light, kind of Wonder Bread–style. It is what it is,” she said philosophically. Another “big secret” to be found at H Mart: The Korean sea salt that Yang uses for finishing dishes at all her restaurants. “Look, this is $1.99!” she said, grabbing a sizable package — way cheaper than the fleur de sel that chefs go crazy for, and just as “sweet and minerally,” she said. More to look for: “One spice that’s different than you often see … Everyone knows white sesame, black sesame, but here, this is wild sesame,” Yang said. “We love using it.” It looks more like brown poppy seeds, with a flavor Yang calls “super-herby … so wonderful.” Use it as a garnish, she instructs, or anywhere you’d use regular sesame. And at the new H Mart in the U-District, don’t miss the upstairs. I didn’t find out about it until the clerk was ringing up my ingredients for the kimchi pancakes (which came out beautifully, and I only aged my kimchi for a few days). Yang had already left (“OMG, upstairs!?! ?” she emailed later). The stairway is tucked away in the front of the store, and the second floor houses millions of kinds of dried noodle soups, Pocky, candy, nuts, sake, soju, and beers from Korea and everywhere, plus rice cookers, chopsticks, slippers, and so much more. It’s a student’s — it’s anyone’s — paradise.